In some use cases it will be important to have cryptographic protocols that protect the privacy of users when signing, authenticating, and during the transfer of certified attributes. 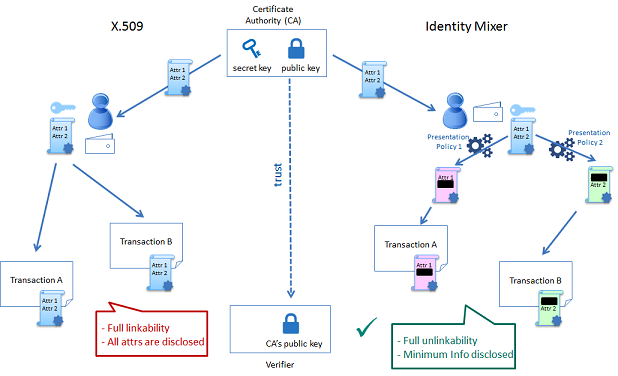 In Fabric this is achieved through Identity Mixer, which has a trust model and security guarantees similar to what is ensured by standard X.509 certificates but with underlying cryptographic algorithms that efficiently provide advanced privacy features such as “unlinkability” and minimal attribute disclosure. Setup. The Issuer (Certificate Authority) signing key pair is generated and the public key is made publicly available. Issuance. Like for X.509 certificates, user’s attributes are issued in the form of a digital certificate, hereafter called credential. A user stores her credentials in a credential wallet application. Presentation. A user signs a message or authenticates with her credentials by deriving a fresh and unlinkable presentation token from her credentials according to an access control policy, hereafter called presentation policy. A presentation policy specifies which attributes (or which predicates about certain attributes) from which type of credential a user should include in the presentation token. It also specifies the public keys of any credential issuing authorities, which the verifier trusts to correctly certify users’ attributes. If the user consents to disclose the information required by the policy, the presentation token is sent for verification. Verification. The token is verified whether it satisfies the presentation policy using the public keys of any credential issuing authorities (CAs). More details on the concepts and features of the Identity Mixer technology are described in the paper Concepts and Languages for Privacy-Preserving Attribute-Based Authentication. The membership service that is instantiated with the Identity Mixer protocols works as follows (see figure below). Setup. The Certificate Authority (CA) signing key pair is generated and the public key is made available to the blockchain participants. Enrollment (Issuance). A peer or a client generates a secret key and creates a request for an enrollment certificate (ECert). The CA issues an ECert in the form of an Identity Mixer credential. The enrollment certificate also contains the attributes that the member has. The ECert is stored together with the corresponding credential secret key on the peer side or by the client SDK. discloses the attributes that are required by the access control policy for the transaction. 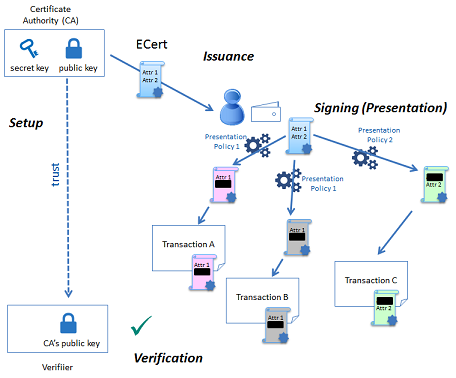 Verifying Transaction Signatures (Verification). The token is verified using the CA’s public key. 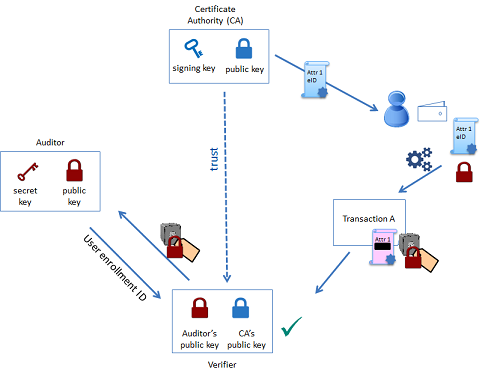 The certificate/credential concept and the issuance process is very similar in both systems: a set of attributes is digitally signed with a signature that cannot be forged and there is a secret key to which a certificate is cryptographically bound. The main difference between standard X.509 certificates and Identity Mixer is the signature scheme that is used to certify the attributes. The signatures underlying the Identity Mixer system allow efficient proofs of the possession of a signature and the corresponding attributes without revealing the signature and (selected) attribute values themselves. These “zero-knowledge proofs” prove that the signature on some attributes is valid and the user is in possession of the corresponding credential secret key. Such proofs, like the X.509 certificates, can be verified with the public key of the authority that originally signed the credential and cannot be forged. Only the user who knows the credential secret key can generate the proofs about the credential and its attributes. When an X.509 certificate is presented, all attributes have to be revealed to verify the certificate signature. This implies that all certificate usages for signing transactions are linkable. To avoid such linkability, fresh X.509 certificates need to be used every time, which results in complex key management and communication and storage overhead. Furthermore, the CA who issues the single-use transaction certificates (TCerts) can still link all the transactions by the same user since it learns the connection between ECert and TCerts during the TCert issuance and the TCerts are attached to the signed transactions. Identity Mixer helps to avoid linkability with respect to both the CA and verifiers, since even the CA is not able to link presentation tokens to the original credential. Neither the CA, no a verifier can tell if two presentation tokens were derived from the same or two different credentials. 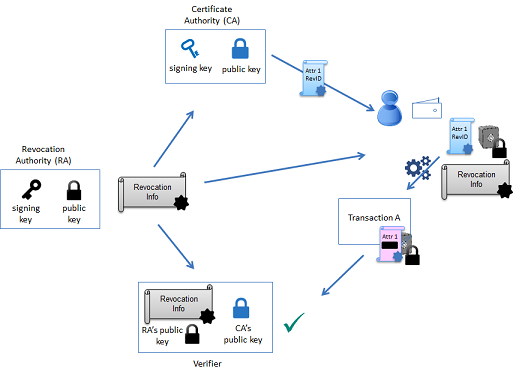 In an example on the Figure below, although transaction A and transaction B are signed with the same credential, the signatures cannot be linked together. Besides being able to hide all or only selected attributes during presentation, the Identity Mixer algorithms allow one to prove only predicates about attributes without revealing their actual values. For example, one can prove that he/she is older than 21 years old by proving that the date of birth attribute lies more than 21 years in the past without revealing the exact date of birth from his/her credential. X.509 certificates can be revoked by adding a unique certificate ID to the certificate revocation list (CRL) and during verification checking if the certificate is not on the current CRL. Since revealing unique identifiers for the revocation check via a standard CRL would break the unlinkability, Identity Mixer implements privacy preserving revocation mechanisms that allow a verifier to check if a credential was not revoked in a zero-knowledge way, i.e., without breaking the unlinkability of unrevoked users. Audit of the transactions is a very important feature and a requirement for many blockchains. In X.509 systems the CA needs to be involved in the audit since the CA can link all the transactions. Identity Mixer allows only specially assigned parties to break the unlinkability of certain transactions under particular circumstances. The Fabric Identity Mixer technology is built from a blind signature scheme that support multiple messages and efficient zero-knowledge proofs of possession of a signature. All cryptographic building blocks were published at the top conferences and journals and verified by the scientific community. This particular Identity Mixer implementation uses a pairing-based signature scheme that was briefly proposed by Camenisch and Lysyanskaya and described in detail by Au et al.. We use the zero-knowledge proof by Camenisch et al. to prove knowledge of a signature. Please refer to the papers for the algorithms details and security proofs. the corresponding contributions to the Client SDK in different languages. An overview of the code contribution is presented on the Figure below. Identity Mixer implementation in GO for the Hyperledger Fabric requires only one additional dependency — a fork from the Miracl crypto library. Setup. The idemixgen tool is used to generate issuer keys. The issuer sends a random nonce to the user. The user creates a credential request using the public key of the issuer, user secret, and the nonce as input. The request consists of a commitment to the user secret (can be seen as a public key) and a zero-knowledge proof of knowledge of the user secret key. The user sends the credential request to the issuer. The issuer verifies the credential request by verifying the zero-knowledge proof. If the request is valid, the issuer issues a credential to the user by signing the commitment to the secret key together with the attribute values and sends the credential back to the user. The user verifies the issuer’s signature and stores the credential that consists of the signature value, a randomness used to create the signature, the user secret, and the attribute values. The Identity Mixer MSP configuration generator (idemixgen) tool is used to generate user secrets and issue credentials. The currently supported attributes are the “Organization Unit”, “Role”, “enrollment ID”, and “revocation” attributes. Signing Transactions (Presentation). An Identity Mixer signature is a signature of knowledge (for details see C.P.Schnorr “Efficient Identification and Signatures for Smart Cards”) that signs a message and proves (in zero-knowledge) the knowledge of the user secret (and possibly attributes) signed inside a credential. Some of the attributes from the credential can be selectively disclosed or different statements can be proven about credential attributes without disclosing them in the clear. Currently only selective disclosure of attributes is supported. Verifying Transaction Signatures (Verification). The Identity Mixer signature is verified using the message being signed and the public key of the issuer. This work is licensed under a Creative Commons Attribution 4.0 International License Revision 2707edec.